The Galaxy MGSR 200 S-pattern grader tire. Because their flexible sidewalls create a larger, more even footprint, radial tires deliver a wide range of benefits on heavy equipment, Sheehey notes. "The larger footprint of a radial tire puts more of the tread in contact with the ground, which transfers more horsepower," he explains. "We get more traction and better flotation with that larger footprint. We also see more even wear across the tread surface, which allows the Galaxy radials to last longer than bias-ply tires, which tend to crown in the middle. "Radial tires are also a lot better on the bottom line," Sheehey says. "For starters, lower rolling resistance results in better fuel economy. The flexible sidewalls absorb more impact than stiffer bias-ply sidewalls do, which reduces impact on welds and joints on the machine. And we have engineered and constructed the steel-reinforced sidewalls with a special belt package and compound that reduces heat build-up, extending tire life." 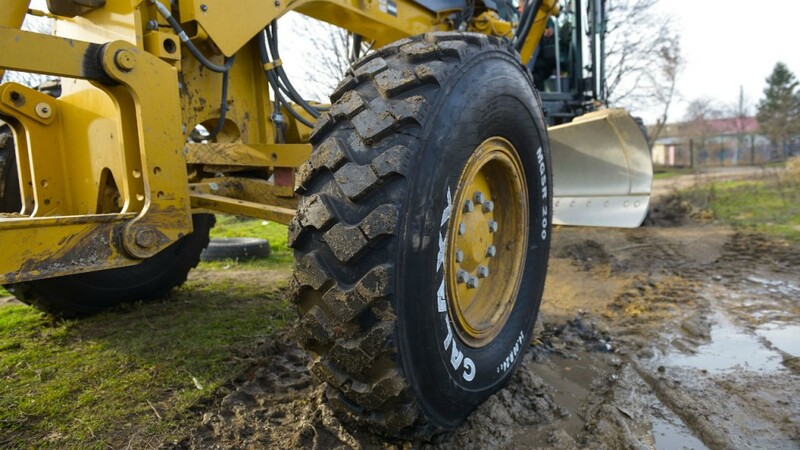 The long-lasting, puncture-resistant tires can help significantly reduce downtime, he adds. Sheehey points out that the new Galaxy radials feature innovative stepped lugs, which boost traction by providing more biting surfaces on each lug. As the tread wears down from one step to the next, the lugs get wider, increasing the rubber-to-void ratio and slowing wear. The stepped lugs, along with the precisely engineered tread patterns, also contribute to excellent self-cleaning. LDSR 300, a loader/dozer tire with an S-shaped tread pattern, available in 17.5R25, 20.5R25, 23.5R25 and 26.5R25 size. HTSR 400, with a long-wearing array of bulky block lugs for articulated dump trucks, manufactured in 23.5R25, 26.5R25 and 29.5R25. MGSR 200, an S-pattern grader tire released in 14.00R24 and 17.5R25 sizes. Yardmaster Radial, a radial version of the popular Galaxy design with massive lugs and high rubber-to-void ratio for forklifts, in 10.00R20, 12.00R20 and 12.00R24. The next phase of releases will include all-steel radials purpose-built for rigid dump trucks, forklifts, and container movers. Longer-lasting tires and improved operating efficiency add up to a lower total cost of ownership for the new Galaxy ROTR line, points out Sheehey. "Whether you're in a waste handling facility, on the construction job site, or moving containers at a port, your key metric is the total cost per hour," he notes. "With our competitive pricing for Galaxy tires, the efficiencies they add in operation, and their long service life, these Galaxy radial OTRs are a significant new offering for us and a tremendous value to our customers."